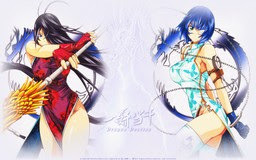 Two new wallpapers to the series 一騎当千 Dragon Destiny (IkkiTousen: Dragon Destiny). First wallpaper is with Sonsaku Hakufu and Ryuubi Gentoku and I named it "Leaders". The second is with Kan'u Unchou and Ryomou Shimei and the name I give to it, is "Warriors". Characters are original design by 塩崎雄二 (Shiozaki Yuji) the creator of the manga 一騎当千 (IkkiTousen). - one is on the top book. The name of the book is 三國演義, what is the original title of Romance of the Three Kingdoms. 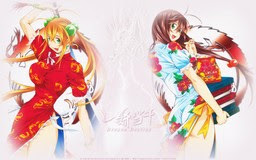 For those that don't know, IkkiTousen is based on Romance of the Three Kingdoms. - the second is on the red book in the middle. The name of the book is 塩崎雄二の伝記, what in English is Biography of Yuji Shiozaki. I just wanted to add there something more so I decided for this one. This two wallpapers are similar to my previous IkkiTousen wallpaper "一騎当千 完全新作始動 - Rivals" and to my older wallpapers "Hakufu and Bachou" and "Ryomou and Kan'u". 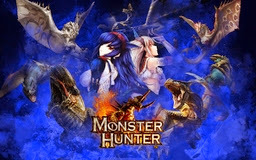 Thanks to elfe-noire43 for the dragon vector I have used in both wallpapers.